Дипломна робота: "Тензорні добутки лінійних топологічних просторів"
Професійна діяльність: Член AMS, Референт реферативного журналу "Mathematical Reviews"
Основні курси: Диференційна геометрія, Основи математики, Додаткові розділи сучасної математики, Диференціальна геометрія і топологія. І.Й. Гуран, М.М. Зарічний, Диференціальна геометрія і топологія. – К.: НВК МО, 1991. І.Й. Гуран, М.М. Зарічний, Елементи теорії топологічних груп, – К.: УМК ВО, 1991. – 76с. Б.М. Бокало, І.Й. Гуран, М.М. Зарічний, Збірник задач з курсу ди¬фе¬рен¬ці¬альної геометрії і топології. К.: ІСДО, 1994. – 72с. Б.М. Бокало, І.Й. Гуран, М.М. Зарічний, Елементи теорії многовидів і алгебраїчної топології (Задачі і вправи). – Львів: ЛДУ, 1995. – 44с. І.Й. Гуран, О.В. Гутік, Математика для економістів-міжнародників: Підручник. – К.: Знання, 2008. – 388с. Б.М. Бокало, В.Л. Бридун, І.Й. Гуран, Навчально-методичний посібний з аналітичної геометрії – Львів: Видавничий центр ЛНУ імені Івана Франка, 2008. – 262c. I.Guran, Topological groups similar to Lindelof groups // Dokl. Akad. Nauk SSSR 256 (1981), no. 6, 1305--1307 (in Russian). I.Guran, Topology of an infinite symmetric group and condensations // Comment. Math. Univ. Carolin. 22 (1981), no. 2, 311--316 (in Russian). I.Guran, Spaces with pointwise countable basis // Vestnik Moskov. Univ. Ser. I Mat. Mekh. 1981, no. 2, 41--44, 87 (in Russian). I.Guran, Minimal topological groups // in: Topology and set theory, 64--71, Udmurt. Gos. Univ., Izhevsk, 1982 (in Russian). I.Guran, M.Zarichnyi, The Whitney topology and box products // Dokl. Akad. Nauk Ukrain. SSR Ser. A 1984, no. 11, 5--7, 87 (in Russian). B.Bokalo, I.Guran, Boundedness in topological rings // Visnyk of Lviv University. Ser. Mekh.-Mat. No. 24 (1985), 60--64 (in Ukrainian). I.Guran, An example of a minimal nonmetrizable topological group of countable pseudocharacter // Dokl. Akad. Nauk Ukrain. SSR Ser. A 1986, no. 1, 6--9, 88 (in Russian). I.Guran, I.Pukach, Embedding of topological vector spaces and minimal vector topologies // Visnyk of Lviv Univ. Ser. Mekh.-Mat. No. 25 (1986), 56--60 (in Ukrainian). I.Guran, On a problem of Arkhangelskii // Visnyk of Lviv Univ. Ser. Mekh.-Mat. No. 30 (1988), 66--67, (in Ukrainian). I.Guran, M.Zarichnyi, The space of continuous functions, and box products // Izv. Vyssh. Uchebn. Zaved. Mat. 1991, no. 11, 22--24 (in Russian); translation in Soviet Math. (Iz. VUZ) 35 (1991), no. 11, 22--24. I.Guran, Condensation of topologically inverse semi-groups // in: Application of topology in algebra and differential geometry (Tartu, 1991). Tartu Ul. Toimetised No. 940 (1992), 47--50. B.Bokalo, I.Guran, Sequentially compact Hausdorff cancellative semigroup is a topological group // Matem. Studii. 6 (1996), 39--40. I.Guran, Some open problems in the theory of topological groups and semigroups // Mat. Studii. 10:2 (1998), 223--224. T.Banakh, I.Guran, O.Gutik, Free topological inverse semigroups // Matem. Studii. 15:1 (2001), 23--43. I.Guran, M.Zarichnyi, Universal countable-dimensional topological groups // Topology Appl. 128:1 (2003), 55--61. I.Guran, M. Zarichnyi, On normality of the strong-weak topology // Mat. Visn. Nauk. Tov. Im. Shevchenka No. 3 (2006), 227-232. T.Banakh, B.Bokalo, I.Guran, T.Radul, M.Zarichnyi, Problems from the Lviv topological seminar // in: Open Problems in Topology, II (E.Pearl ed. ), Elsevier, 2007, p.655-667. I.Guran, Janos Bolyai in Lviv // Symmetry: Art and Science, The Journal of ISIS-Symmetry, 1-4 (2008), 146-149, (in Ukrainian). T.Banakh, I.Guran, A.Ravsky, Characterizing meager paratopological groups // Appl. Gen. Topol. 12 (2011), no. 1, 27-33. A.I.Gatalevich, I.I.Guran, B.V.Zabavskyi, et al. Vasyl Ivanovych Andriychuk (September 18, 1948–July 7, 2012), Mat. Stud. 38:2 (2012), 218--219. T.Banakh, I.Guran, I.Protasov, Algebraically determined topologies on permutation groups, Topology Appl. 159:9 (2012), 2258--2268. T.Banakh, I.Guran, Perfectly supportable semigroups are σ-discrete in each Hausdorff shift-invariant topology, Topological Algebra and Applications, 1 (2013) 1–8. I.Guran, Ya.Prytula, Jozef Schreier "On finite base in topological groups'', Mat. Stud. 39:1 (2013), 3--9. T.Banakh, R.Grigorchuk, I.Guran, et al. 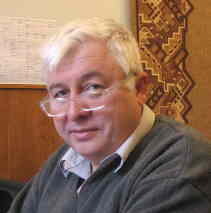 Igor Volodymyrovych Protasov, Algebra Discrete Math. 17:2 (2014), C--F.